Something to snag those dark nightmares and bring in the sun. These may be the perfect decor for your scene or scrapbook. Sleep and design better with these mystical embellishments. 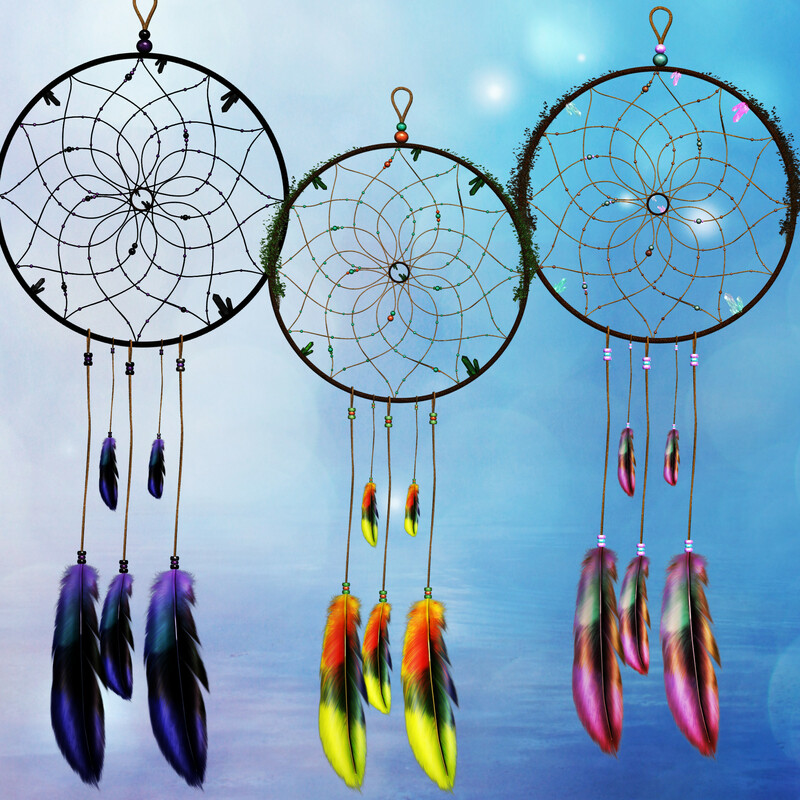 Something different and interesting–a pack of ten dreamcatchers in different colors. In some Native American cultures, a dreamcatcher or “Sacred Hoop,” is a handmade willow hoop, on which is woven a net or web. 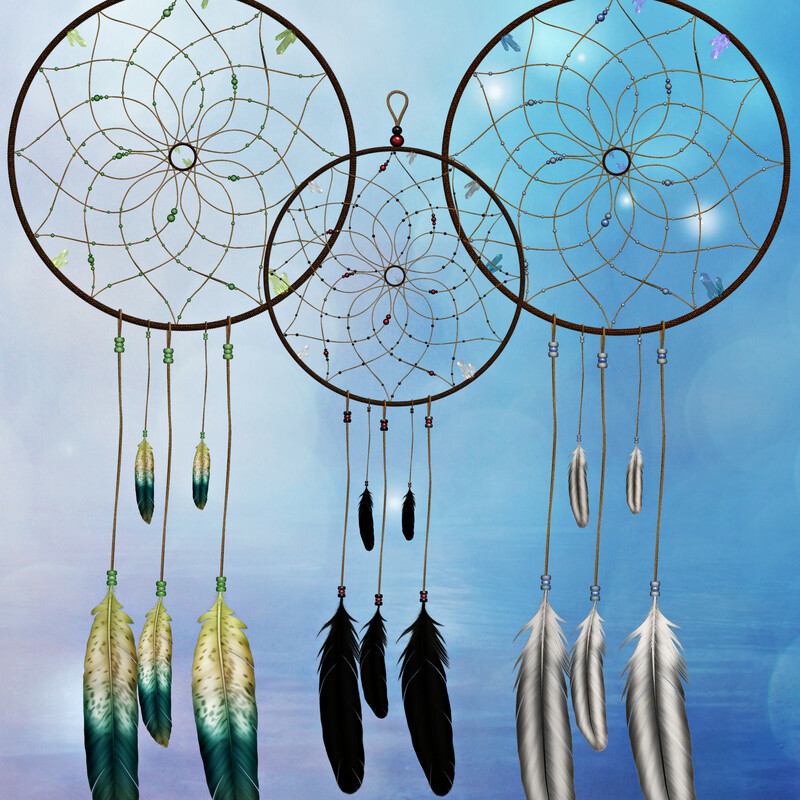 The dreamcatcher may also include sacred items such as feathers or beads as shown in the promos. Traditionally, they’re often hung over cradles or beds as protection. Used as talismans, they were used to protect sleeping people, usually children, from bad dreams and nightmares. Native Americans believe that the night air is filled with dreams, both good and bad. Anyone who suffers from nightmares would likely agree. Hung above the bed in a place where the morning sunlight can hit it, the dream catcher attracts and catches all sorts of dreams and thoughts into its webs. Good dreams pass through and gently slide down the feathers to comfort the sleeper below. Bad dreams, however, are caught up in its protective net and destroyed, burned up in the light of day. Perhaps we could all use a dreamcatcher to catch those pesky nightmares. Well, here’s your chance to give one a try, a digital dreamcatcher that is. Does it have the magic of the real one? I don’t know. At any rate, it will looks great in your creations from fantasy, western, to something darker. There are 10 royalty free, high-quality clip art PNG images included in this package. All of these graphics have transparent backgrounds, making it easy for you to use them as tubes or nozzles–or merely to drop into your design. The size of these images varies, but they are approximately 900 x 2400 pixels. All are 300 DPI, making them great for print projects. This package is one zip file, which is about 10.6 MB.